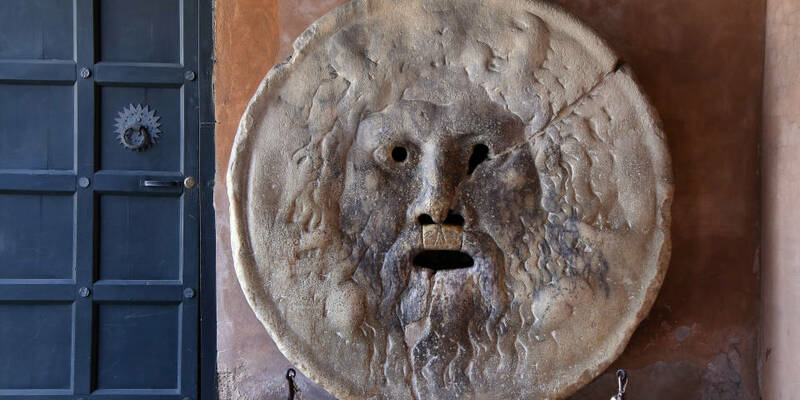 The Mouth of Truth (Italian: Bocca della Verità) is an ancient image, carved in a round Pavonazzo marble (Italian: marmo pavonazzetto) slab. Gloomy face of unknown god is set in the portico of the church of Santa Maria in Cosmedin. 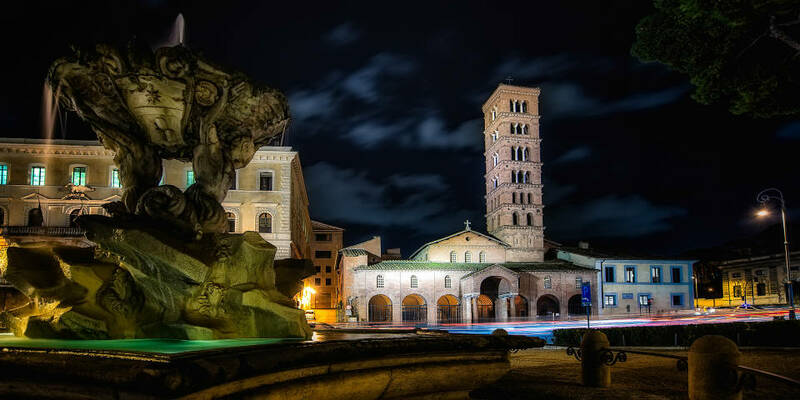 The church is located on the left bank of the Tiber river, contemporary area of ancient Roman buildings. Scientists believe that the place has an age of about 2,200 years, and the Romans are convinced that it is impossible to tell a lie under a stern gaze of the mask! This time-worn marble disc weighs 1,200 kg (about 26400 lbs) with a diameter of 175 cm (about 5ft 9in) and thickness of 19 cm (about 7in). The purpose of the object with prominently engraved features of a man’s face with eyes, nostrils and mouth in the form of holes has not been still found out. The most probable are versions of the decoration of fountain or of a manhole cover in Ancient Rome. In the Middle Ages, the Mouth of Truth was called a “lie detector” due to the poet Virgilio Grammatico, who, being engaged in active magic practice, believed that doubting in each other’s loyalty husbands and wives will be able to learn the gospel truth in front of the stone face. In the 15th century there was a legend that a female cunning could evade the Mouth of Truth. 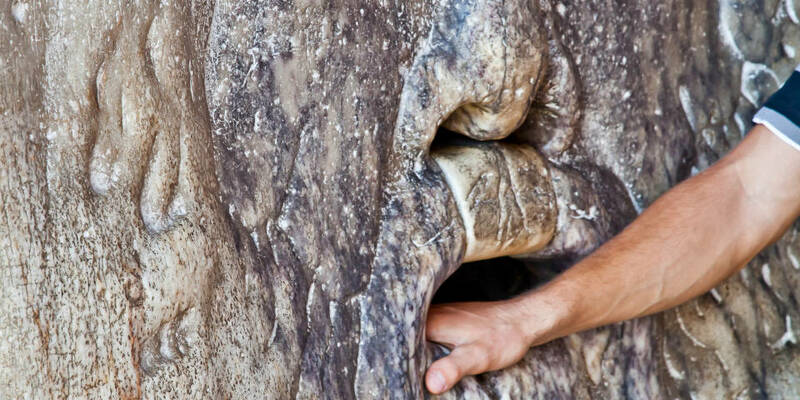 There was a thought that a woman, suspected of betrayal, has to put her hand into the mouth of the stone deity. Nothing will happen to an innocent, and a sinner will lose her hand. Once, a frivolous wife of a Roman nobleman has been subjected to trial by means of the Mouth of Truth. At the time, when a woman was about to put her fingers into the stone mouth, a holy fool ran out of a crowd, suddenly hugged her and kissed. After the insane was driven away, the trial continued. When they asked her if some other man, except her husband, has touched and kissed her, dona pointed only at the madman. Having fearlessly put her hand into the stone mouth, she remained untouched. The judges and her honorable spouse didn’t give a thought that role of a holy fool has been played by her real lover. 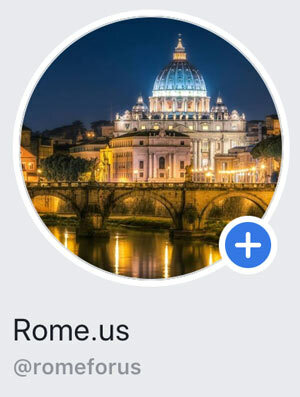 The name “Mouth of Truth” was assigned to the disc in the middle of the 15th century, and it was installed vertically only in 1632 by Pope Urbano VIII Barberini. At first, it was located directly in front of the church, and then – moved to the portico. In the 15th century Danish engraver Lucas van Leyden created a series of works named “Power of Women”, using the Mouth of Truth as one of the decorations. In English-speaking countries the Mouth of Truth became known in 1953 due to the distribution of the movie “Roman Holiday”. It is interesting, that the ancient artifact has served as the voice of truth of Gregory Peck’s and Audrey Hepburn’s characters, because they were not honest with each other. In 2000, a scene from “Roman Holiday” was recreated in the Japanese film “Sleeping Bride” by Hideo Nakata. Also, similar references were used in the American melodrama “Only You” with Robert Downey Jr. and Marisa Tomei. In 1968 an American writer Robert Silverberg published his futuristic novel “Nightwings”. The plot leads us far into the future, to the city, which is a science fiction projection of Rome. The climax takes place in front of the Mouth of Truth, where the main characters reveal their secrets. In addition, the image of the mask is used as a decoration for the electronic machine, issuing tickets with the predictions, produced by the company DPS-Promatic. Mechanical oracles are popular in Italy, Britain, Spain, China, Japan and Turkey. You also can find such an imitation of the mysterious ancient disc in the botanical parks of the United States and France. Bus: №51, 81, 85, 87, 118, 160, 628, 715, C3 (Greca stop), № 44, 83, 160, 170, 716, 781, C3 (Bocca della Verità stop), №23,280 (Lungotevere Aventino). Metro: Line B, Circus Maximus (Circo Massimo) station. Opening hours of Church of Santa Maria in Cosmedin and its surrounding area: daily from 9:30 a.m. to 05:30 p.m.
Tickets: free entrance, waiting in line is for about 10-20 minutes. On the map of Rome, there is another point of interest, dedicated to the Mouth of Truth – the Fountain of the Tritons (Italian: Fontana dei Tritoni). It is located near Bocca della Verità bus stop.